Looks like a number of us have recently jumped aboard the Slap & Fold train. The technique is not new, and many of us were late to join. I thought it good to share our experiences here so that we can exponentially increase out knowlegde concerning this technique. All I know so far is what I’ve learned from others that came before me. HERE is a VIDEO for those that are new to the techniques. 1 - Others have mentioned the value of resting the dough for short (5-10) minutes or so inbetween sessions. I just finished resting and then continuing the Slap & Folds. Boy, did the dough get nice and supple during the rest. Too bad I didn’t think to take pictures. UPDATE - I elected to use Coil Folding instead of gentle Slap and Folds to replace Stretch & Folds after the initial dough development attained from Slap & Folds. 3- I think I stumbled on to something really nice. I am preparing a 123 SD. I choose Slap & Folds (because they are so much fun) but the dough is somewhat dry for this procedure. Since I was willing to increase the hydration, I decided to try wetting my hands in order to introduce more water. Low and behold, it worked great. I was able to slowly and precisely increase the hydration to a point were the Slap & Fold “sweet spot” began. I imagine “Double Hydration” or “Bassinage” would be the correct term for adding additional water to the dough. The reason for this post is definitely not to promote myself as an authority on Slap & Fold. I am in the infant stages of learning this technique. Hopefully others will join in with personal observations, lessons learned, and other valuable information that will enable us to learn this technique more thoroughly together. Dough goes from a shaggy mass to more structured. Seems to get stickier again and some structure is lost. Starts to gain more structure again and then goes from strength to strength. I also noticed that after initially coming together the dough will at some point slightly break down again. But continued Slap & Folds fully redevelop the gluten. I agree, there's a "magic moment"
At the beginning, you start with a shaggy mass that gradually becomes smoother and stronger, less and less sticky. And then, just when you think things are looking really good, the dough (for me, at least) seems to get all loosened up again and there's an "uh-oh" moment. Well, your hands are already looking like they're wearing cement gloves, so you just give things a rest, then carry on. And in the process, there is that "magic moment" when all of a sudden the dough acts like it's more interested in sticking to itself than to you. And your hands shed all the stuff that's built up on your finger tips while the dough becomes smoother, more elastic, slightly shiny and just really pretty. Especially with the 50/50 dough, which had all of those little bits and bobs in it. Somewhere out there is a video of a guy doing slap and folds in the bowl. He tacks the bowl onto the bench with those little squares of what's probably chewing gum for offices (in France, they're called PataFix), and has at it. Very picturesque description of the process, Carole. I think that will be helpful for those learning the process. I am glad you brought up this topic. I haven't tried the S&F yet, because I have been able to get windowpane dough without it. But, now I am wondering if the windowpane test is truely an accurate way to determine if you have developed enough gluten. I am very much tempted to make some dough today in which everything else is the same, but for 1 loaf I do 200 S&F and the other loaf I work the dough inside a bowl until windowpane is achieved. Do Slap and Folds:-) S&F's are Stretch and Folds a different thing for sure. 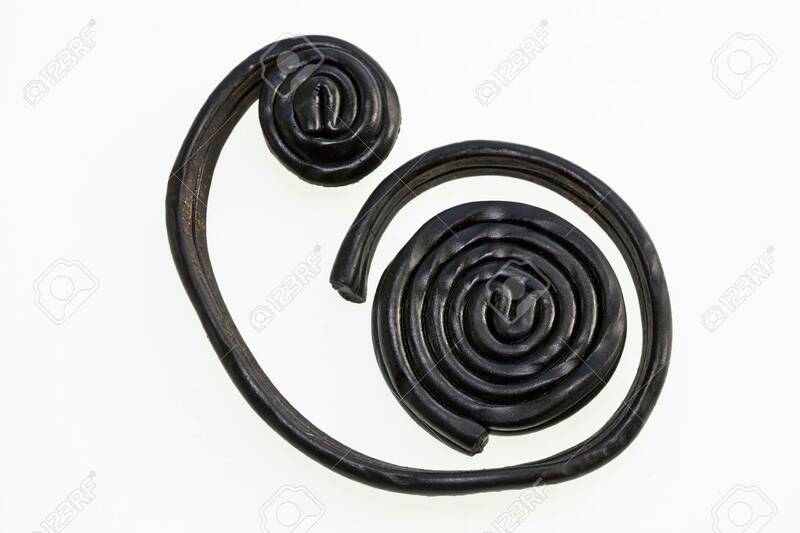 And coil folds are now called some kind of Sleeping Ferret Fold and I still don't know what the heck the latest Lamination Stretching that Ru007 is doing really is so I can't comment on that.. But I do know that S&F's are stretch and folds....I think. Happy Slapping. You will cleaning dough off the ceiling when it get really wet! for Newbies is that the 71% hydration is about the bare minimum for slap and folds for a white bread. It is good for them to get the feel of dough and what extensibility and gluten development feels like in dough. You can actually feel the dough getting stronger as the guten develops and you can see to tell when it is time to stop when the dough starts tearing. Then it is time to stop for 20-30 minutes not 5. Let the dough relax and become extensible again. The next set of slap and folds will not take nearly as long but stop when the dough feels strong and not tearing. From then on you can do 4 stretch and folds from the compass points or what I prefer 4 - a bit more slow and gentle slap and folds. at this point even 4 gentle slap and folds will tighten the dough right back u without deflating it. When Don Baggs and I are doing 2 sets 150 slap and folds 5 minutes apart, for a nice Chianti slurp , We are using grocery store bought AP flour at 75% hydration. The extra water and lower protein make for a much more extensible dough that will take 300 slap and folds in the first 15 minutes without tearing no problem and it is a lot more sloppy in the first 3 minutes too:-) Remember everything in bread baking is relative. Learn the feel of dough and train your eyes to know what they are seeing. As you bake a lot of different breads over the years with different flours, whole grains, sprouted flours, etc you will learn what each dough feels like and what it should look like at the beginning and end of important milestones. There needs to be a pinned post somewhere on this site for all of the acronyms, and descriptions of a the nicknamed processes and stuff... A freshloaf glossary. As someone who has been here for a few weeks, I keep running into acronyms or odd words I don't understand. I am still hoping to get yalls opinion on the efficacy of the windowpane test. We probably should update it. Here is what is says for S&F. S & F: S & F can mean "stretch and fold" or "slap and fold." Slap and fold is usually done for about 20 minutes whereas stretch and fold is flipping the dough out and doing one round of folds every 30 minutes, then 30 minutes later at 60 minutes, then 30 minutes later at 90 minutes (after mixing the dough) and again, 30 minutes later at 120 minutes from mixing the dough. After folding the dough is flipped back over and corners tucked under. the dough covered and allowed to rest and rise until the next 30 minutes comes around. We definitely need a dististinction for this one. Any ideas? “SLP & F”? Any better ideas? SLAF for slap and fold and STAF for stretch and fold? Alfanso used FF for French Folds. I may start to use that as an acronym. where too boring. Strutting Peacock Fans are my new personal favorite because my apprentice invented them between upchucking on my ties. Vomiting inspires her I think. comes in at 65% hydration. French Folds aka slap and folds (sounds like something I do with my laundry after the dryer cycle), work just dandy with this dough. So I'll submit that mostly White flour doughs as low as the mid 60 hydration range will be French Fold Friendly, friends. And that would include a minor percentage of whole grains added as well. As mentioned elsewhere, I've been a French Fold Fanatic from my formative fashioning for dough since my earliest days on TFL, having learned the technique from Babette en La Cocina, Amasado francés. In Spanish, but this version has the English language voice-over. And yes, 150, 5 minute or so rest, 150 and then into the bulk rise tub is my ticket to a well developed mix. And unless you want to be scraping wet dough splats from your kitchen walls and floors when the hydration is high, keep the first 10 or 20 FFs cool, calm and collected. The dough will come together quite quickly, and then you can proceed with gusto. Just before proceeding with The Chianti phase! I find S & F really useful especially when I do more than one loaf and I really cannot manage to do the Rubaud on those as my arms just give up!!! we learned that technique at King Arthur during an entense sour dough class. After much dough flying most of us got it! Did you learn anything pretaining to Slap & Fold at King Arthur that hasn’t been mention thus far? Thanks for this video :-) Very useful for me. fold. Remember the slap stretches the dough in one direction but the fold stretches half of it in the other direction. Remember to pull your hands apart and treche the gough as you fold over. Dan, don't sweat that "gluten damage"
as your arrow points to. Minor and insignificant. If folks think that gluten development has completed just because we finish with a few hundred French Folds, I'm here to parry that thought. The initial mix, in this case the French Folds, is to begin the organization of the gluten strands and the development of the web. It is during the bulk rise and letter folds where the real action takes place. Which is why the No-Knead method is possible. Dough is dumb as dabrownman says, and a little "scrape on the knee" is easily recoverable during the bulk rise phase. One can fret over the least of the issues, as this one is, but the handwringing won't change anything. The dough will do what it is programmed to do. Now, once the bulk rise is well under way, that is the time to be concerned with tearing the dough. At this early stage, not even a not so much. I wasn’t thinking about the accompanying S&F or Coil Folds. The surface damage would only become an issue if it occurred on the finished surface. The follow up S&F or Coil Folds would create many layers and the slight surface damage would be incorporated into the dough. 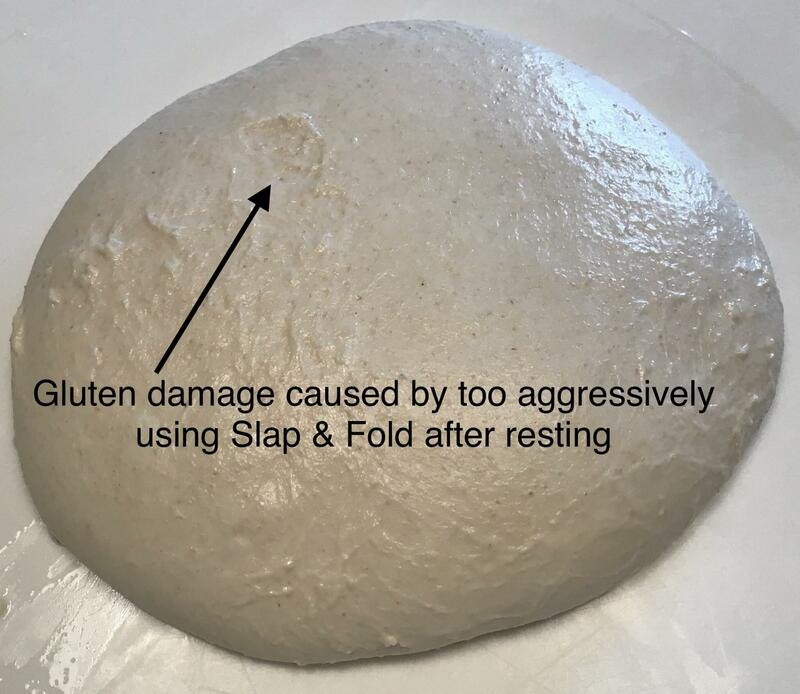 But I think if the surface starts to shred during Slap & Folds the dough should be allowed to rest before continuing, or the Slap & Folds have done their job and no longer needed. What you are going to find is that every different mix has its own unique characteristics during the French Folds. The dough will seem to behave beautifully, and then all of a sudden fall apart. Or develop a kind of donut hole in it. But soldier on! When all is finished, it will return to behaving itself. I point this out in my Bouabsa video during the FFs. Very early on I had that first experience, thought that I had badly mis-measured something or other and threw the dough out to start over again. I wasn't at the point of understanding yet what the dough might do during the FFs. if you haven't reached the number of FFs that you think the dough should have (300 is my standard for most doughs) my belief is that the work isn't yet done. And if you leave the dough sitting to rest too long, keep in mind that at this point the yeast component has been added and is already working its nefarious ways. That should be taken into account when considering the total duration of the bulk rise. It's all a matter of experience and knowledge applied. Where you pick itnuo with both hands and place it back down in an "e" shape? I'm coining another terminology - the "e" fold. TBH by the time I'd finished with slap and folds it wasn't loose enough for an e fold. Jewish woman making bagel dough using slap and folds. There was a huge pounding noise, bam,bam and a pause and then bam, bam, bam. This was loud stuff. I go to the kitchen to see who is being beaten to death and it was was bagel dough at 53% hydration. She was slapping that dough down as hard as she could, and, being a larger woman with years of experience, she lifted her hands and dough way above her head and three times in a row really spanked it on that wood table as hard as she could. Then slapped it hard on top, after every fold, to teach it a lesson. She said sorry to wake you up but this is the way to make good bagels.....if you want them to be good.......and no one wants a bad bagel. She finished up in about 10 minutes and managed to live for about forever as a result. It's such a shame we can not give rating bumps to posts--thumbs up or up-vote it. Hilarious. That short paragraph was vivid and I saw the fat on her triceps as she raised the dough above her head. "Lived to be about forever". Oh man. Love it. old to mix them up. My wife remembers her Grandfather kneading bagel dough the old fashioned way and then when you least expected it, he would pick it up and slam it down on the table one time and knead some more and then there would be another loud slam. That was his part of bagel making the his wife took over the process after the kneading was done.. Her Great Uncle Ben lived to be ]104 but he told me that it was bourbon that made it all possible and Ben never lied. He had so many wonderful stories that we forced him to write a book of his life. He lead one of the most interesting lives I have ever heard of.....that no one knew about.